Does the thought of the Annual School Bake Sale keep you up at night? If you’ve ever found yourself lying awake at midnight, bemoaning the time-consuming task of creating clever baked goods for your start-of-school fundraiser, then you’re clearly in need of a good recipe for whoopie pies. 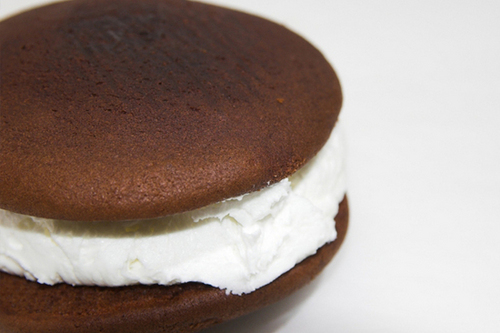 Whoopie pies are a classic treat from Lancaster County, Pennsylvania, the heart of Amish country. There, and in local markets throughout Pennsylvania, Maryland, and Virginia, these gigantic, soft, homemade versions of Oreo cookies abound. History tells the story of whoopie pies in this way: Amish women would bake up large, soft, chocolate cookies, pressing two of the cookies together with a thick layer of fluffy vanilla frosting between. They’d wrap the cookie sandwiches individually and nestle them inside their husbands’ lunchboxes before the men headed to the fields for a day of work. When lunchtime arrived and the hungry farmers would discover one of these sweet, delicious treats in their meal, they’d shout, “Whoopie!” Also called hucklebucks, gobs, and black-and-whites, there is no getting around it, Whoopie pies are a true treat. When it comes to school bake sales, it’s important to donate baked treats that are individually wrapped, eye catching, and hardy enough to stand up to delivery and a bit of manhandling. Whoopie pies deliver on all counts. They are inexpensive to make, easy to wrap in single portions, and the deep black chocolate cookies with fluffy, pure white frosting centers makes these cookies absolutely irresistible to kids and adults alike. In fact, whoopie pies are guaranteed to be such a hit at the annual bake sale, that you’ll only have one problem—you’re going to have to stay up all night baking enough whoopie pies to feed the whole school. Prepare the cookies: Follow the directions on the back of the cake mix, however, reduce the water to 2/3 cup. Drop by the rounded tablespoonfuls onto lightly greased cookie sheets; bake in an oven preheated to 350 degrees F for 12 to 15 minutes, or until tops of cookies spring back to the touch. Prepare the frosting: In a saucepan, whisk together the milk and cornstarch; heat mixture over medium heat, stirring often, until it becomes very thick; remove from heat and cool COMPLETELY. In a large bowl, beat together powdered sugar and shortening. In a medium bowl, beat sugar, shortening, and vanilla until fluffy. Add the flour mixture and beat with an electric mixer until frosting is extremely fluffy and light. Spoon large heaps of the frosting onto the bottom of one cooled cookie, then press a second cookie (bottom sides touching the frosting layer) gently against the frosting. Prepare to amaze: Wrap each whoopie pie separately with plastic wrap. Store in the refrigerator until bake sale day arrives. Carry in a large basket and get ready to impress your schoolmates, school moms, and schoolmarms alike!